I watch her from behind, just like her little dog, which is waiting patiently. The lady is part of a very large number of pilgrims, who come here every day to prostrate on the temple's entrance. People arrive in groups or are just accompanied by their grandchildren or quite often by their little dogs. I realise, the question 'Why' should not even be asked. Yet Tibet is more than religion and myth. Geographically it is the Top of the World. And your body will make you feel this. Your high altitude destinations will most likely give you a headache, make you dizzy or short breathed during the first days. But your eyes will be rewarded by the sight of an incredible clear, blue sky, and views over green valleys or high passes and barren land, guarded by the eternal beauty of the Himalayan mountains. A land, where Yaks, decorated with red ribbons are pulling the plough through the fields of the fertile Yarlung valley; where the endless sky is touching the horizon and colourful prayer flags protect the passes and mountains. Intense blue skies are challenging snow-capped mountains and stars have never been as close to you as here! 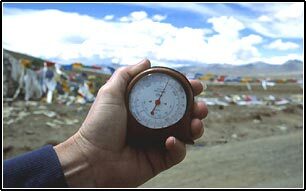 Tibet touches you: physically and mentally! Come to see the Top of the World! It's probably a once in a lifetime experience and it will leave you astounded, exhausted and aware of the preciousness of human being. 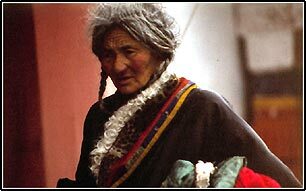 But don't expect to understand the secrets behind the Tibetan myth. 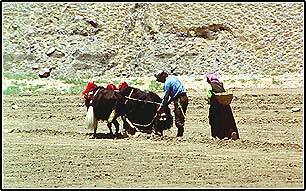 Tibet has to be felt! It does not allow more than a glimpse!